*Appointment is required for any other services"
Family Reunions and much more..
CD-ROMS and DVD in Jewel boxes with full color inserts. 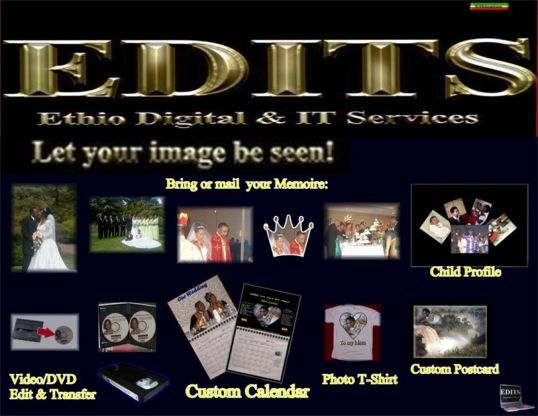 Pictures can be taken with a special request for your digital printing or multimedia production. Puzzles: for a great gift and party favors. EDITS is designed to empower innovation and fuel technical literacy amongst immigrant communities who otherwise never would have the opportunity. Share the education with a broader participation among immigrant communties through Multimedia distribution. Encourage family and community involvement practices to academic goals to achieve student performance and attendance in school. Capture the education for long-term use by creating technology programs to utilize multimedia technology appropriately. Provide access to low-income and disadvantage children's to technology using Mobile Studio where there is no computer access in their neighborhoods. EDITS: "Turning Technology and community issues in to Solutions"
CopyRigth © 2012 .Ethio Edits. All Right Reserved .